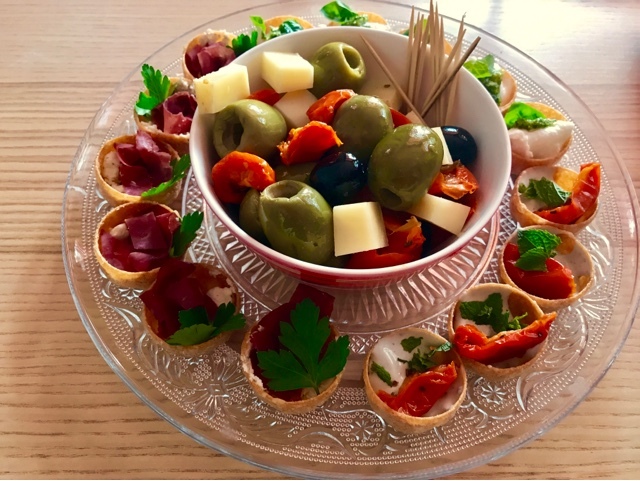 This time I am just sharing a quick and easy, but tasty and elegant hors d'oeuvres idea to serve with a glass of bubbly. These were a prelude to a big Saturday BBQ dinner of Greek chicken and lamb souvlaki served with roast new potatoes and my rice and orzo pilaf, tsatziki, asparagus and a Greek salad last weekend. An old colleague of husband's was visiting and we had a fun night of lots of food and quite a few glasses of cava and rose. We'd spent the day with husband on an NHS diabetes education course and I had retrogressed to the annoying swot I was in school and turned into Hermione Granger with my hand up in the air for another comment or question when everyone else was ready for a break with tea and biscuits. With diabetes they shouldn't really have been having biscuits, but first on the queue was a 6 foot 5 and 20 stone biker looking dude so I didn't want to make a big deal but gently whispered to husband my concerns about biscuits. Husband just pretended he didn't hear me and completely ignored me tugging at his sleeve. He glued himself to the biker and had two very large biscuits with his cup of tea. After the fun afternoon foot care / amputations session the traffic at the biscuit tin seemed to go down a little. I got the idea for these appetisers from myself, actually. I did similar nibbles a few weeks ago when we were staying at my parents little island in Finland. My parents deposited me, husband and his younger son (older son was getting drunk and losing his possessions in various places in Europe, also called interrailing) on the island the previous afternoon and came the next day with my brother and his wife. I had prepared three kinds of little crispy rye bread cups to serve with a welcome toast of sparkling wine. 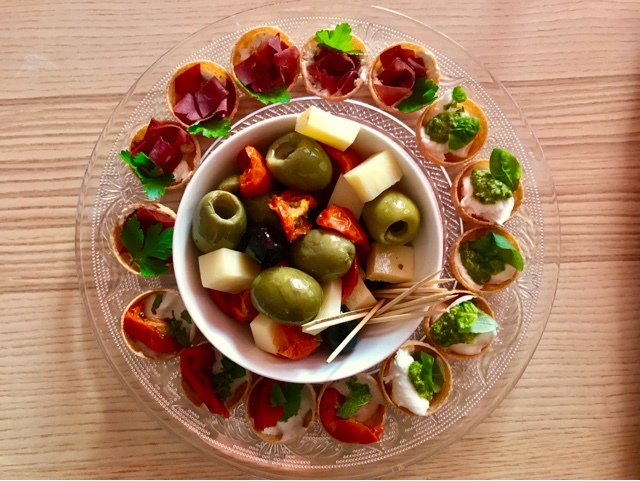 The cups were spread with a rocket and pesto cream cheese and then filled with either smoked lamb or gravadlax and dill or mozzarella and pesto. I set all this on a little table outside and reminisced about a similar occasion some years ago when I had prepared glasses of Pimms and some nibbles on that same garden table ready to welcome my cousin and his husband to the island. My parents' effervescent labrador got completely overexcited by these totally amazing people coming to see her and quite possibly to rub her belly or oh my gosh maybe even throw the ball on this very best of days. She was always very bouncy in a Tigger kind of way and now bouncing around the yard she managed somehow to place one of her bounces directly under the table and sent the whole thing flying, Pimms and all. She then ran to hide in the clover field behind the cabin realising she'd messed up. No one was even angry with her really- you couldn't be, there was not a bad bone in that ebullient, chubby little body now happily bouncing on the eternal clover fields of heaven. 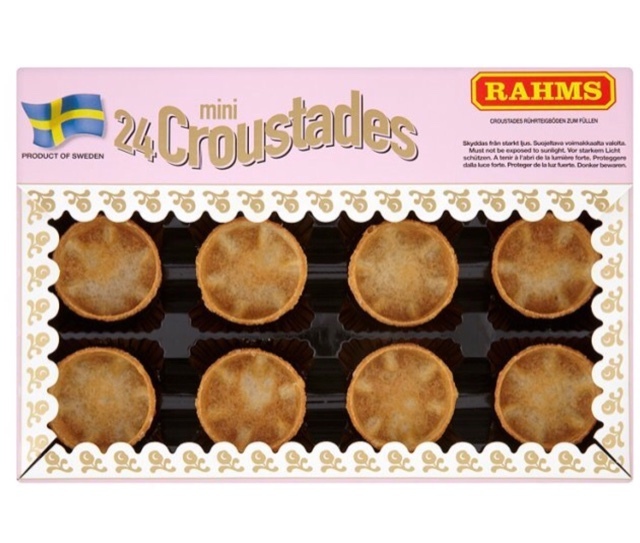 This time I didn't have these excellent rye cups, but I had a pack of Swedish Rahms mini croustades cups from a little delicatessen in Notting Hill - I think Waitrose sell them too. I did smoked reindeer (substitute with any other smoked or cured meat like bresaola) with goat cheese and parsley, mozzarella with homemade pesto and basil and soft blue cheese with roasted cherry tomatoes. But you can fill these with anything, my smoked salmon mousse / spread would do beautifully.